What is the difference between vitamins, minerals, antioxidants and hormones? The main difference is that antioxidants are too-often over-looked. I'm kidding, at least partly. Hormones are not on the list because hormones are not nutrients. We'll get to that later on. The first three — carbohydrate, fat, and protein — are considered macronutrients. Your body requires these in "large" quantities each day, which is why we measure these in grams. Water can be thought of as the fourth macronutrient, but like antioxidants, it is often neglected. Vitamins, minerals and antioxidants we measure in miligrams or micrograms. Antioxidants, vitamins and minerals behave differently from macronutrients. Instead of yielding energy, they help your body carry out necessary and important physiological processes. It is said that about forty of these nutrients are essential for life because your body cannot synthesize enough to meet your physiological needs. Therefor your diet provides you the bulk of these essential nutrients. What is the difference between a vitamin and an antioxidant? You may have heard that vitamin C and vitamin E are antioxidants. Which are they? Vitamins or antioxidants? They're both. These two classifications are not mutually exclusive. Antioxidants can be vitamins. 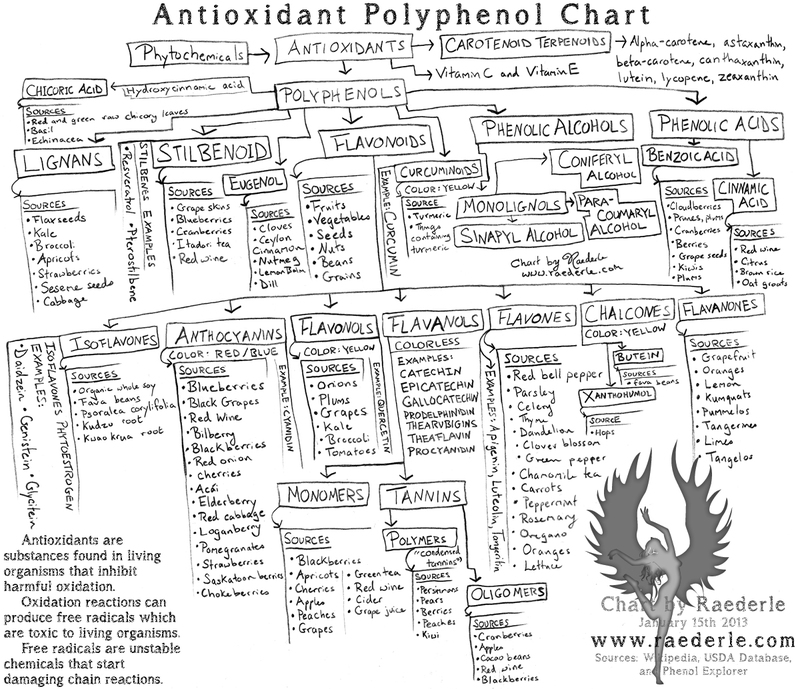 What antioxidants do is protect your cells from damage caused by free radicals. Free radicals are formed as part of your natural metabolism (exercise) but also by environmental factors, including smoking, pesticides, pollution and radiation. Free radicals are unstable molecules which react easily with essential molecules of your body, including DNA, fat and proteins. When a free radical attacks a molecule within you, it will then become a free radical itself, causing a chain reaction which can result in the destruction of your cell. Antioxidants have the property to neutralize free radicals without becoming a free radicals themselves. In short, antioxidants are chemicals that offer up their own electrons to the free radicals, thus preventing cellular damage. That said, lycopene has incredible beneficial properities, like being highly protective against sun damage. In fact, without lycopene or something similar, you will visibly wrinkle. Try eating ten servings of lycopene-rich food every day for three days prior to sun exposure, and then don't eat any oils, animal products, nuts, seeds, beans, legumes or grains the day you're outdoors a lot. Wear no sunscreen and watch how much longer you can stay in the sun (provided you drink plenty of water). Then, if you do burn, apply lavender essential oil. It works even better than using a fresh aloe plant. I know from personal experience and second-hand experience: choose lavender! No mess, no fuss, no chemicals! Antioxidants, I believe, are the next area of nutrition to explore. In the past hundred years we've come a long way in the understanding of nutrition. We've invented theories such as "the complete protein" and then proven them false. We've had ideas like "one day everyone will just eat pure energy (carbs)" and then discovered the utter failure of such limited intake. Antioxidants are those unique properties which make foods "medicinal". When we talk about the "special properties" of turmeric, pomegranates or blueberries, we're talking about antioxidants. Yet, these healing properties vary dramatically from the tannins in green tea to the resveratrol in red wine. You can't just eat a bunch of tannins and expect the same results you'd get from the lycopene in watermelons or the resveratrol in wine. To read about antioxidants click here. All my links open in new windows, so you won't lose this page. Now, let's learn more about vitamins. Vitamins ("vita" meaning "life," and "amine" meaning "containing nitrogen"). Vitamins are organic, meaning that they contain carbon, which is an element found in all living things. Vitamins are compounds, meaning that they contain atoms of one or more different elements. Vitamins are vulnerable to heat, light, and chemical agents. Thus, cooking, food preparation, processing, and storage must be appropriate to preserve vitamins in food. My personal preference is to simply process food as little as possible. I don't cook my food, and I freeze and dehydrate foods minimally. For example, I froze many blueberries that I picked over the summer to get frozen organic blueberries at the crazy-low price of only $1.50 per pound. I also got to eat unlimited blueberries while picking and enjoy the great outdoors. In this case, I feel that freezing the blueberries is still a nutrient gain. How can that be? Well, even though the blueberries were more nutritious when fresh, blueberries are such a nutritious food that I feel it is better to have some frozen blueberries in the winter are better than no blueberries. Also, it was economically sensible for me as well. Water soluble vitamins: Water is required for absorption. Excreted in urine. Fat-soluble vitamins: Requires fat for absorption. Stored in fat tissue. Vitamins A, E, and K1. When vitamin K1 is consumed in tremendous quantity, you can convert vitamin K1 to vitamin K2. Eating one to two pounds of leafy greens per day is considered sufficient for keeping bones healthy. If you don't have time to eat a huge salad each day, add leafy greens to a smoothie in the morning and have a large salad with dinner. It should be noted that vitamin D is not really a vitamin. Vitamin D is a hormone. The word "vitamin" implies that your body can not produce it, which is why I have these listed under Other "Vitamins.. Your body is designed to be able to get these from eating a diet rich in leafy greens and living an outdoor lifestyle. Today, when people don't eat many greens and don't get outdoors much, it is very common to see people deficient in both, despite the fact that we can get these from diet as well as being able to generate these. What is a hormone? How is a hormone different than a vitamin? A hormone is regulatory substance produced in an organism (like you) and transported in (your) tissue fluids such as (your) blood or sap to stimulate specific cells or tissues into action. In essence, hormones are something your body creates. Vitamins are something you have to get from food. Antioxidants can be vitamins and they can be horemones. Glutathoine, for example, is an antioxidant created by your body. Glutathione is composed of the amino acids glutamine, cysteine, and glycine. It is a "linear tripeptide" which, as far as I'm concerned, makes it also a protein. So, since glutathoine is made by the body, it is a hormone. Since it is made of amino acids, it is a protein. And because glutathoine reduces/prevents oxidative damage in cells, it is an antioxidant. What is the difference between minerals and the vitamins/antioxidants? Antioxidants prevent oxidative damage. Vitamins are considered essential nutrients that are not minerals. But what is a mineral? Minerals are pure inorganic elements, meaning that they contain atoms of the same element. Minerals are much simpler in chemical form than vitamins. Unlike vitamins, not all minerals are essential nutrients. Minerals are more stable to food preparation than vitamins, but mineral loss can occur when they are bound to other substances in foods (such as oxalates found in spinach and tea, and phytates found in legumes and grains), making them unavailable for the body to utilize. To release the phytates in seeds, soak them overnight in drinking water with added sea salt. Then rinse thoroughly before preparation. This not only improves digestion, it also improves flavor. There are major minerals and trace minerals. Major minerals: Measuring in quantities of 100 mg per day, or more. Calcium, phosphorus, potassium, sodium, chloride, magnesium, and sulfur. Trace minerals: Measured in very small amounts, such as 5 mg per day. Iron, iodine, zinc, chromium, selenium, molybdenum, copper, and manganese. There is a lot of propaganda about nutrition. What we eat is central to our culture, our emotions, our health and many of the economic structures of our society. It really is no wonder there is confusion and conflict concerning food consumption. By understanding the basics about food, biology and nutrition, you protect yourself from costly mistakes, like fad diets, ineffective medications, and over-hyped so-called super-foods. I highly encourage you to read Six Critical Things You Don't Know About Plants next. This article will quickly arm you with the information you need to avoid the myriad scams of supplements and foods. Not that I'm against supplements. I'm not. Although, I have often asked why animals in the wild are fine without supplements, yet we're not. Why is that? In this article, I explore why wild animals are healthy without supplements, yet humans seem to need them. Part of the difference, of course, is that we're growing mono-crops in depleted soil instead of everyone having their own thriving permaculture garden. If we all took advantage of aquaponics, permaculture, solar power and a healthy, sustainable diet (which doesn't necessarily have to be all vegan), then we could easily feed over 100 people per acre. Why do I say it doesn't have to be all vegan? Well, despite being primarily vegan myself, I am more concerned with the overall sustainability and efficiency of everything we do as a whole. Electric cars versus gasoline cars, hybrids versus biking, wool versus polyester, drywall versus cob, and so on. That is why I have extensively explored each of these topics, and more, in my article Beyond Veganism. If you read and thoroughly let your mind digest all of the content in this article and the articles I've linked in the paragraphs above, you'll find yourself immune to much of the supplement advertising, vegan propaganda and western medical lies. My goal is not to indoctrinate you with any nutritional dogma, but to give you the basic concepts required to make your own educated decisions. In fact, this is core aim of my free e-course, which you can sign up for below.